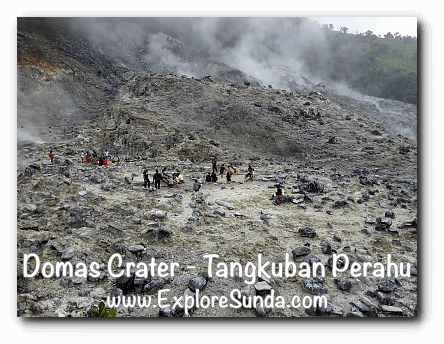 One of the crater in Mount Tangkuban Perahu that is safe to be visited closely is Kawah Domas (Kawah is Bahasa Indonesia for crater). There are two ways to reach it, both need some hiking. 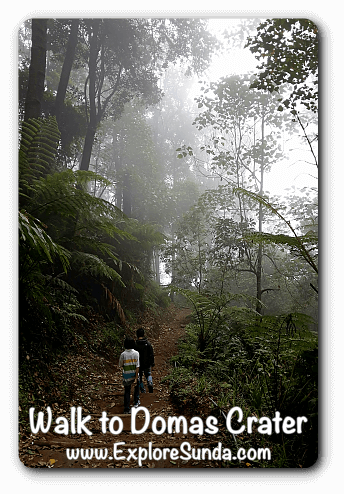 The first and longer route is hiking from Kawah Ratu (Queen Crater) through the woods. This route requires a lot of time and energy. My recommendation is to go to Kawah Domas via the proper entrance. We definitely pass it on the way from the ticket booth to Kawah Ratu. There is a limited car park and clean public toilet in front of this entrance. Since we have to walk for approximately 1.2 kilometers through the forest, we must hire a guide. 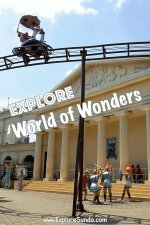 In 2017 the ticket for domestic tourist is Rp. 100,000 excluding tip, for one guide. Each guide may lead up to six visitors. in this forest. So we know which one is the edible fern. 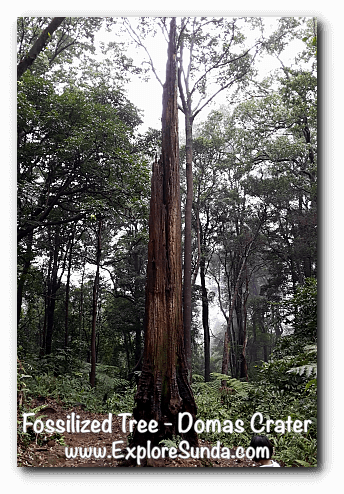 Then he pointed out the oldest tree in this forest, it is a 300 years old Jamuju tree. It lives in a ridge right next to the trail. It looks like other tree, but he told us that what we saw is the top portion of the tree, we can’t see the majority of the trunk, which is below the ridge. The last eruption of Kawah Domas was in 1969. During that eruption, the hot lava passing trees destroyed them or made them an instant wooden fossil. Although the fossilized trees are dead trees, they are still upstanding until now, but the trunks are hardened instead of weathered. 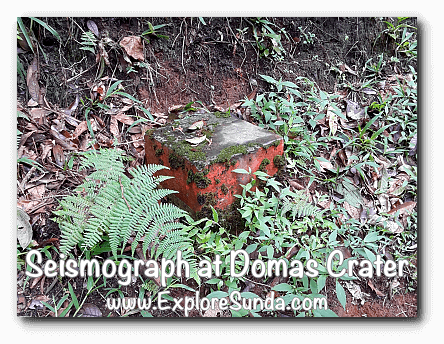 Presently, Domas crater is still active, hence, the Indonesian Agency for Meteorological, Climatological and Geophysics (BMKG) is monitoring its activities. The device is a small metal on top of what looks like a small brick cube. It is a very important device for the safety of thousands to millions of people, therefore, whenever you see one of them, please don’t vandalize it. The first 900 meters of the total 1.2 kilometers hiking to Kawah Domas is relatively easy, since it is slightly sloping dirt path. 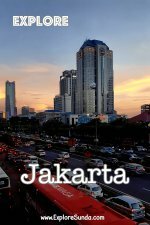 We even can hire ojek (a motorcycle taxi) to reach this point, although it is expensive. Then we have to cross a bridge and the trail slopes downward with several stairs on some points. Overall, the hiking is not that difficult. Near the entrance to Kawah Domas, the path will merge with the grueling path from Kawah Ratu directly to Kawah Domas. We can easily tell we have reached Kawah Domas, due to the strong smell of sulphur. It is ten folds stronger than Kawah Ratu. Regardless of the smell, we can take pictures here and walk right into the crater. There are several pools here, the very hot one where we can boil eggs and the warmer ones where we can soak our feet or take a mud spa for an additional cost. Although Kawah Domas opens daily from 8am to 3.30pm, the best time to visit it is in the morning. 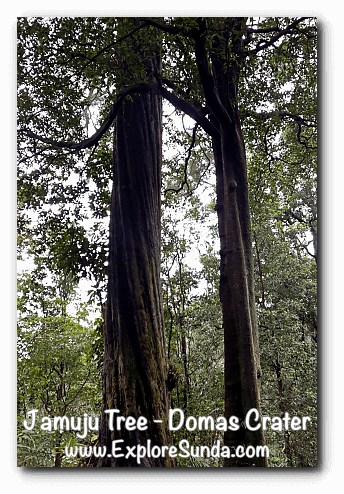 If you are lucky you will see Lutung Jawa (Javan Langur, Trachypitecus auratus), Surili (Javan Surili, Presbytis comata), Tando (Flying Squirrel, Petaurista elegans), and Elang Jawa (Javan Eagle, Spizaetus bartelsi) along the trail. Since the hiking usually takes approximately 30-40 minutes one way, it is better to wear comfortable clothes and walking shoes. Should you want to try mud spa or soaking in the hot pool, it is better to wear shorts and t-shirt. However, rain and fog is unpredictable in this mountain. The trail could be closed anytime whenever the weather is not favorable. 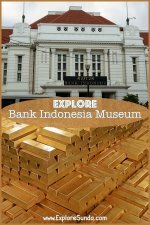 When I was browsing the internet, I read so many negative reviews and comments about visitors' experiences in Tangkuban Perahu, including Domas crater. Most of them felt hassled with the peddlers asking to accompany them to the crater and kept asking to buy their merchandise. 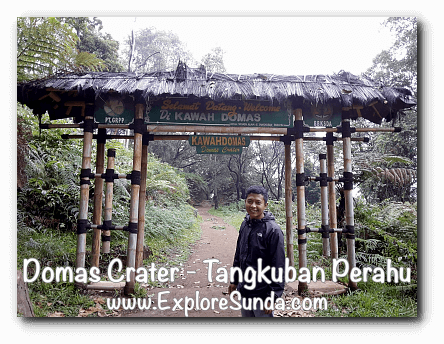 Let us share our experience during our visit to Domas crater: We, the ExploreSunda.com, visited Domas crater on a Sunday noon in October 2017. First, we found out it is a guided hiking to the crater, an additional cost on top of the ticket we bought at the entrance gate. But the price is officially stated in the ticket booth. Then, there were only us and the guide along the way, not a single peddler seen. The guide has a good knowledge and explained a lot of things about the ecosystem, we learnt a lot from him. So, we have good and memorable experience there. 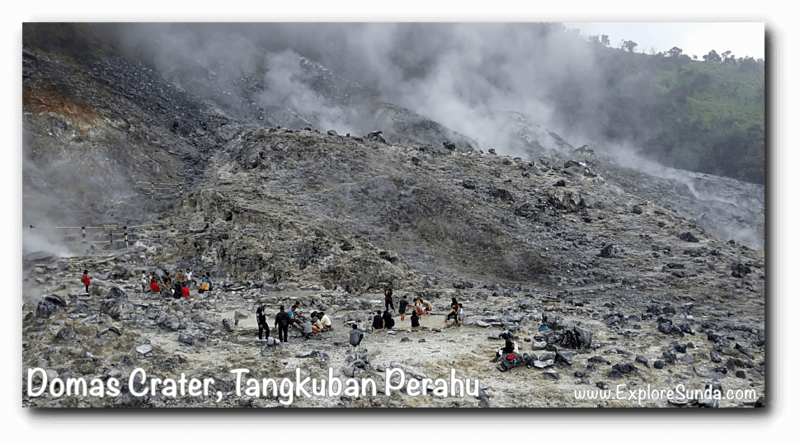 A visit to Mount Tangkuban Perahu will not be complete without seeing Kawah Ratu (Queen Crater), the largest crater in this mountain. Then, Kawah Putih (White Crater) in Ciwidey, Southern Bandung is another recommended crater for the outdoor fun.